Do you need to Access Your Data In Real Time With Web Services? 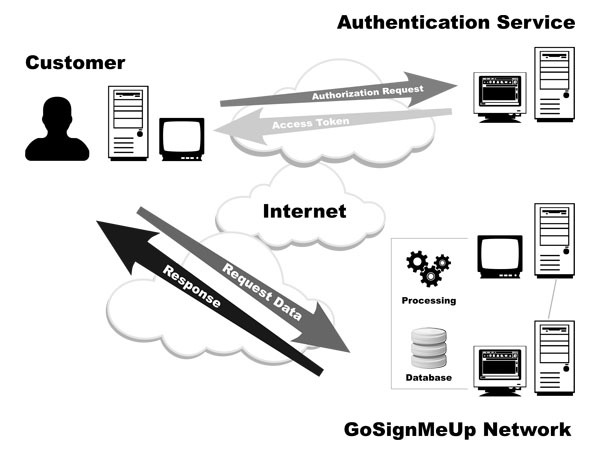 GoSignMeUp offers “Web Services” as feature to compliment our registration system. “Web services” describes a standardized way of integrating Web-based applications using open standards over an Internet protocol backbone. Web services allow organizations to communicate data without intimate knowledge of each other’s IT systems behind the firewall. This means your company can request registration data over the internet and the GoSignMeUp servers will process and feed out the results in real-time. There is a secure layer to the request because it first must be authenticated, for increased security. Using Web Services a customer can request student, roster, course and attendance information from the GoSignMeUp servers remotely. Web services allow a customer to process attendance, transcript, as well as send surveys and certificates. In addition you can add and update courses and course descriptions, as well as student information. Access Your Data In Real Time With Web Services! If you want to expand your capabilities in regards to accessing your user data, be sure to inquire about GoSignMeUp’s web services! Visit www.GoSignMeUp.com, call 888-286-4826 or email, info@GoSignMeUp.com.